The Gerstle River Glacier drainage is approximately 8 miles east of the Silver Fox Roadhouse. The towering mass of carved ice that makes up the glacier can be seen from our cabins. The glacial river drains into the Tanana River, which drains eventually into the Yukon and out to the Pacific ocean. The salmon migration from there ends in the Tanana and its tributaries as far north a Delta Jct. in the Clearwater river. However, they do not go up the Gerstle River drainage due to the glaciated water. The drainage does provide habitat for a varied amount of wildlife. Around the Glacier and the surrounding mountains there are Dall Sheep. Grizzly and Black bear also inhabit the wooded area of the glacier along with moose and caribou. The bears in particular can sometimes be spotted way above the timberline in the snow capped mountains. But then, the bears can also be found down in the low elevations along the river along with the moose. The caribou stay in the high lands and are only seen occasionally at lower elevations during times of travel from one feeding spot to another. During a sheep hunt Wily Spain harvested this Bull Moose about one half mile below the Glacier where the timber is just starting to get a grip on the landscape. We had been hunting high in the mountains looking for sheep when we spotted the Bull down near our camp. Since a moose in camp is better than two sheep in the bush, we headed down. We had watched the moose off and on all day and from our vantage point way up high, it made for a fairly simple stalk. It was Wily’s l5th birthday and that is the only present he got. The whole hunt was video taped. 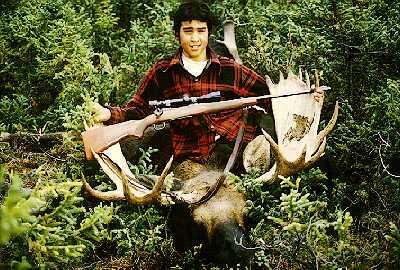 We had a great 15th Birthday celebration when Wily harvested the moose. It was one of the best birthday parties I’ve ever attended. Unfortunately, no one else showed up and we had to pack the whole moose out ourselves; two happy hunters.